Who were the “Mercury Seven”? The “Mercury Seven” were the first people to be selected to the U.S. astronaut corps. They were Walter M. Schirra Jr. (1923–2007), Donald K. “Deke” Slayton (1924–1993), John H. Glenn Jr. (1921–), M. Scott Carpenter (1925–), Alan Bartlett Shepard Jr. (1923–1998), Virgil “Gus” Grissom (1926–1967), and L. Gordon Cooper Jr. (1927–2004). All became national heroes. 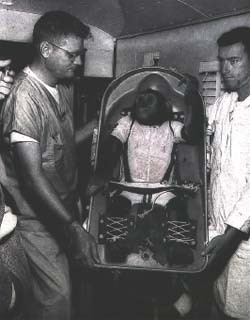 The first American in space was not a human, but a chimp named Ham. Ham was launched into space in 1961 to test the Mercury capsule for safety.